Having established that God does have a plan that we can find and trust within his word, week two brought us along to Abram/Abraham. To Abram God made promises that would drive much of the story of the Old Testament. He would make Abram into a people as numerous as the stars and he would give them a land, and all the blessings God would give would also being a blessing to the whole world. These and all promises of God ultimately find their fulfillment of Jesus Christ. We’ve had several reasons to reflect on history this week. I already mentioned the anniversary of the protests at Tiananmen Square and today is the 70th anniversary of the invasion at Normandy. We’ve read through a great history of people like Abraham and Joseph, and one emphasis this week was to recognize that the history we read in Genesis is our history. We are children of Abraham because we are children of the promise by faith. So when we read of God’s promises to Israel, we stand under those promises, too. But remember the promise God makes to Abraham. It is a promise for blessing, but God also notes that through Abraham’s family will all the families of the earth be blessed. If we are children of Abraham, we cannot merely celebrate that blessed status. We need to remember both that we receive a blessing as part of the promise, and we are to also be a blessing for all the world. We finally come to the Ten Commandments in Exodus 20, a codified law for God’s people. To many, the law characterizes the Old Testament and the old covenant, and given its prominence not only here, but throughout the many books of the Old Testament, it isn’t hard to understand that view. But do not forget the preceding chapters and stories in Exodus and Genesis. God graciously created this world and placed us in it. God has provided for a people that he chose for himself, not based on their superiority as a people, but because of his grace. God called Abraham out to be the father of many nations, made a covenant with him, and while Abraham struggles in his faith, God remains ever faithful. He protects his people, provides for them, and in Exodus we see how God set them free from the oppression in Egypt. Instead God hears the cries of his people and frees them from Egypt. He sets them free, parts waters, gives manna from Heaven, and also as an act of grace, he then gives them this law. Grace precedes the law. The Israelites were never a people who earned or deserved God’s favor. They did not merit it. God chose them for himself, and in his grace saves them. The law follows as a way to live as God’s people, and a way to live well. Be careful when simplistically dividing the Old and New Testaments as though one were law and the other grace, as though grace were absent in the beginning. The Bible is a book that reveals to us who our God is, and we see he is and always has been a God of grace. In reading about Joseph, a story I’ve read before, heard a lot about, and have even watched a movie on, it was fun to see what jumped out this time. We all know Joseph for his coat of many colors. It was given to him by his father Jacob, because Jacob loved Joseph dearly. It was an outward sign of his father’s favor. But that robe would later be a sign of his brother’s treachery, as they take his robe and give it to Jacob indicating Joseph had been killed by an animal. Joseph goes from being loved in his father’s house, to being stripped of his fine clothes, sold into slavery, and he ends up working in Potiphar’s house. But God was still with him as he prospered in all he did and found favor in Potiphar’s eyes. 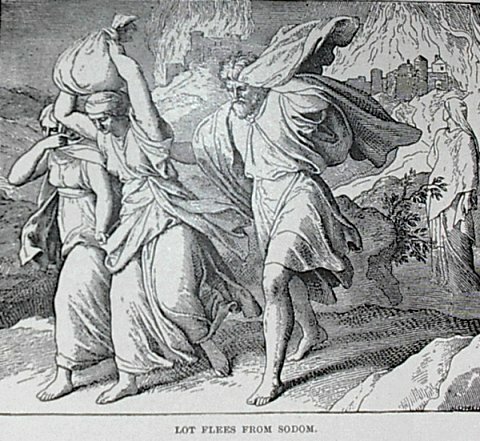 Unfortunately again Joseph’s dress was used in a plot for his harm. 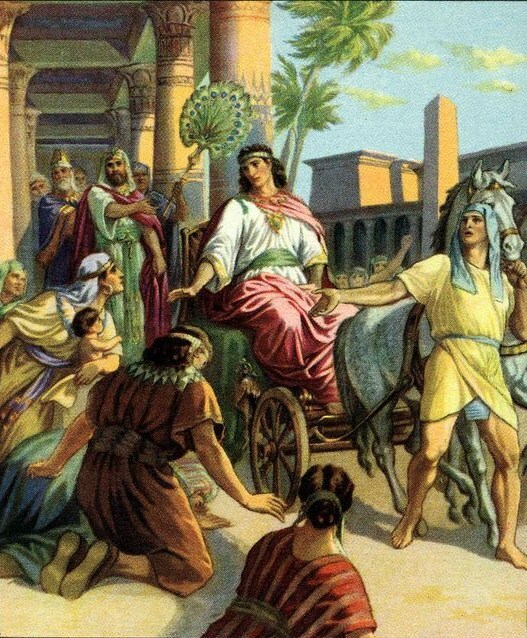 After rejecting advances from Potiphar’s wife and in the process leaving his cloak behind as he fled, Potiphar’s wife takes out her anger against Joseph by presenting the cloak as though it were proof of his misdeeds. Joseph is again upended and goes to prison, where again he prospers and finds favor with those around him. Joseph ends up, through the work of God in giving him interpretations of dreams, leaving prison to be the highest ranking man in Egypt, except for Pharaoh himself. He had been robbed of his life by his brothers when they stripped him of his robe, but now he is restored by Pharaoh who, in chapter 41, “took his signet ring from his finger and put it on Joseph’s finger. He dressed him in robes of fine linen and put a gold chain around his neck.” Again we have an outward sign of Joseph’s status. He is dressed in such a way by Pharaoh for he is valued and given great responsibility in the land. We see clothing play a part in another story that will be read in the coming weeks from Luke. 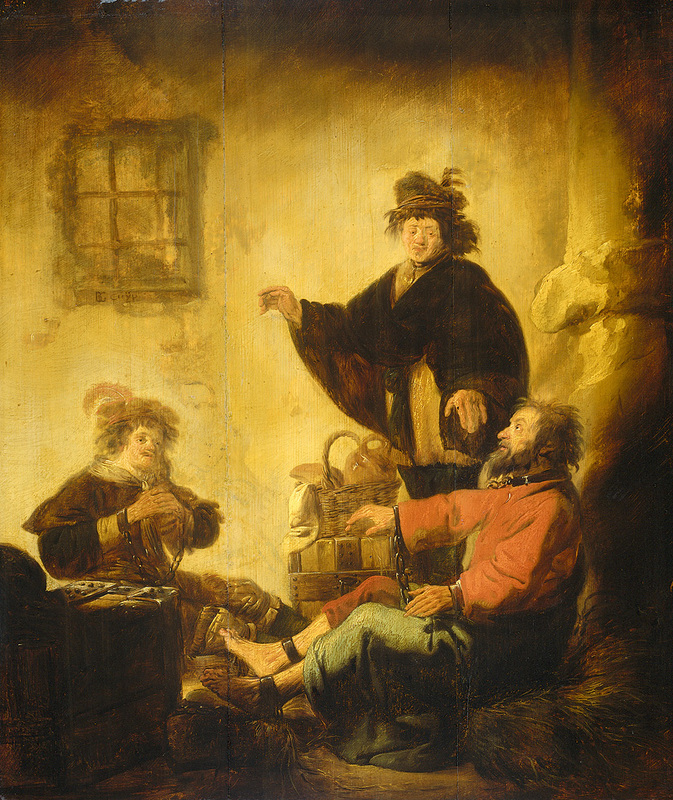 The prodigal son leaves his father’s house and upon his long-awaited return is dressed in a ring and given shoes and the household is told to make preparation for a great celebration. The clothing signifies the father’s joy and acceptance of his son. Whatever status is afforded to us by the way that we dress in this life cannot compare to the status that comes by our being clothed with Christ. Our clothes represent much of who we are when we are clothed in him. For when that is the case, we who are sinners gain instead the appearance of Christ’s righteousness. When our God sees us, he does not see our sin, instead he sees the perfection of his Son. As we close out Genesis and John, the contrast is clear. So many figures of old are just ordinary like you and me. The only extraordinary one is seen in the gospels, and that is Jesus Christ. We do not boast in Abraham, Isaac, or Jacob, nor can we boast in ourselves. We only boast in Christ. If not for our being clothed in him, boasting in his appearance, we would be nothing. We finish Genesis reading about Joseph and we learn that he was more than just a stylish dresser. Pay close attention to him and how he differs from previous characters of the book. Whereas Abraham, Isaac, and Jacob/Israel were blessed in many ways, but continued to mix their faithfulness with sin, Joseph’s situation is very different. He is hated by his brothers, thrown into a pit, sold to slavery, and labors in a foreign land, and how does he respond? Others couple God’s explicit blessings with their own mistakes. Abraham is concerned for his safety so he lies about Sarah, multiple times. Jacob is characterized by his trickery in order to receive further blessings. But, Joseph in the midst of trials and difficulties exhibits strong character. He brings in a different pattern, so pay attention to him and how he acts, regardless of the circumstances, as we finish Genesis. We finish our first books this weeks as both Genesis and John come to a close. They are some of the longer books of their respective testaments, so I hope that can be an encouragement to you and will build some momentum for your reading. Today is Easter and John will give you additional time to review the events that led to Christ’s death and to rejoice at his resurrection. The story of Genesis will closely follow Joseph and will end with his death. This is a perfect time to try out a reading group, as well. If you’ve had questions about either of these books, bring those questions along with you before we press on ahead to Luke and Exodus. We are almost at the end of another week of reading and it has been another week packed full of stories from Genesis. We talked during our reading group about the continuing journey of Abraham and focused a good deal about Jacob/Israel. One thing that struck me that connects Genesis and John was the hard truth Jesus speaks about how many events in life are there to bring glory to God. What makes this hard is that these events may not be what we find enjoyable. Jesus heals a blind man in John 9, and people wondered who sinned to bring about this man’s blindness. Jesus’ response is that he did not sin, nor his parents, rather he was born blind so that the works of God might be displayed in him. Surely this man rejoiced at being healed by Jesus, but it must be difficult to look back on years of blindness that were in service of bringing glory to God. Jesus’ friend Lazarus is sick and his sisters urge Jesus to come quickly to help. Jesus does not hurry and instead stays two additional days before setting out. He says to his disciples, “This illness does not lead to death. It is for the glory of God, so that the Son of God may be glorified through it.” The illness does lead to death, but that death is not final as Lazarus is raised from the dead. Again a seemingly tragic event turned around to bring glory to God. 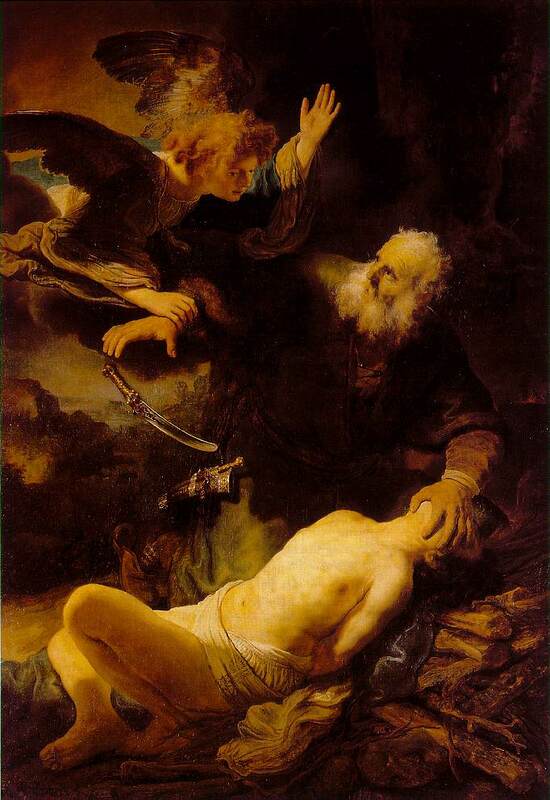 Back in Genesis, Abraham is tested by God as God asks Abraham to sacrifice his son, Isaac. It is a devastating task set before Abraham. But as he is faithful and obedient to God, Abraham learns more clearly just how perfect God’s provision is and God receives glory in providing a ram. Difficult conditions and tests of life are still difficult for us, even if they do ultimately give glory to God. But this is one of the hard truths of faith that we are always trying to better accept and understand. We are not our own and our lives are to be like living sacrifices, pleasing to God (Rom 12). It helps me to remember that what God doesn’t require from Abraham, God has done himself. God has given us his only Son. God has endured the greatest sacrifice for our sake. Therefore if my life can in some way bring glory to the one who has brought life for me, I hope and pray that I can do so joyfully.